4 x 2-1/4" ZZ-ELH410 extended label holder is designed to be used with shelf bins, they fit in place on the integrated label holder. Can be displayed at a 10° angle. Offers a quick and easy method to identify stored items. 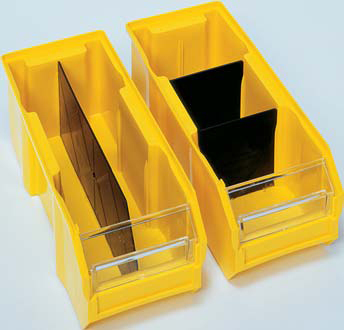 Extended label holder fits all shelf bins except ZZ-QSB100. Designed specifically for larger barcode scanning. 4 x 2-1/4" ZZ-ELH445 extended label holder is designed to be used with shelf bins, they fit in place on the integrated label holder. Can be displayed at a 45° angle. Divider label tabs attach to existing dividers to improve the visibility of bin labels and for easy scanning of barcodes. Each case come with 6 divider label tabs. 5-3/4 x 3 x 1" Dividers are used in tough, high density shelf bins to create compartments allowing the contents to be separated. Dividers fit tightly into bins. Uniquely designed to allow for easy labeling via individual label slots. Label slots allow for sorting and identification of contents. Dividers are to be installed horizontally across bins. 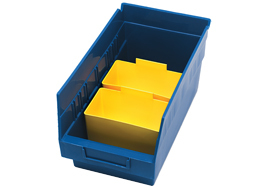 Seven dividers can be fitted into one bin. 5-3/4 x 3 x 1"
6 x 3-1/4 x 5" Dividers are used in tough, high density shelf bins to create compartments allowing the contents to be separated. 6 x 3-1/4 x 5"
7-3/4 x 3 x 6-1/4" Dividers are used in tough, high density shelf bins to create compartments allowing the contents to be separated. 7-3/4 x 3 x 6-1/4"
10-1/2 x 3-1/2 x 7" Dividers are used in tough, high density shelf bins to create compartments allowing the contents to be separated. 10-1/2 x 3-1/2 x 7"